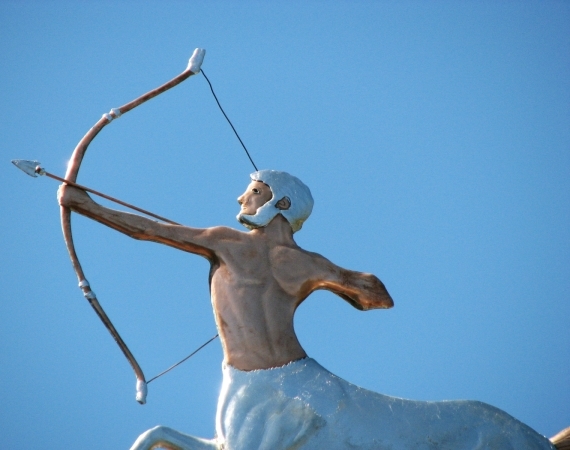 This Standing Centaur Weather Vane is a recent design in our Greek Mythology series. This series includes Zeus, Poseidon, Nike (Winged Victory), Pegasus and Goddess weather vanes. 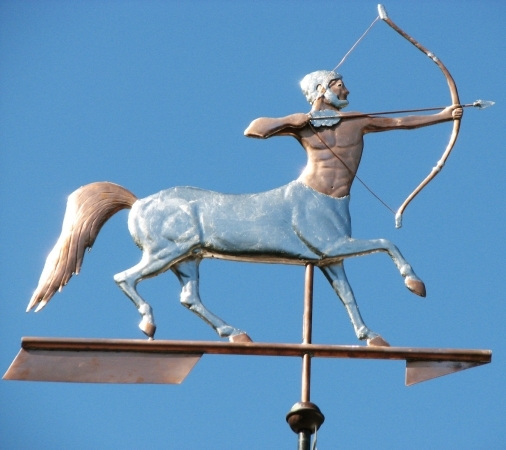 We presented two Centaur Weather Vane designs to our customer. She had seen a famous 19th century Centaur Weathervane in a museum and wanted one for herself. 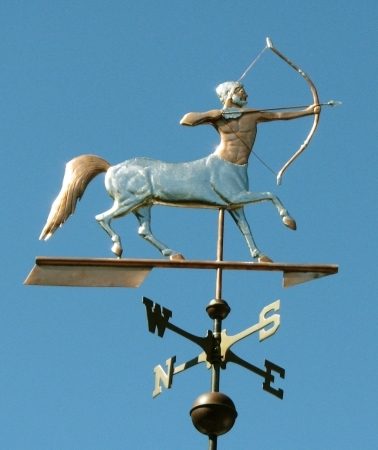 This customer ultimately went with the Galloping Centaur Weather Vane design, but we also liked this Standing Centaur Weather Vane so much that we decided to put it on our website as a design and recently competed our first order for it. In our original design the Centaur’s upper body was portrayed with optional gold leaf to create a vivid contrast between the human torso and the horse body. For this commission our customer preferred optional palladium leaf gilding on the horse’s torso, the Centaur’s hair, and details on the bow and arrow. We think this vane will weather in wonderful ways with these bright silvery sections in contrast to the eventual patina greens of the copper! Our customers can select the metal combination they find appealing; for example someone might also want the horse’s tail shown with optional gilding. 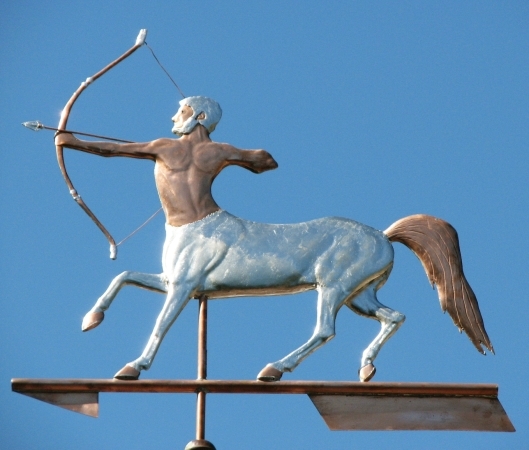 Because each weather vane is custom crafted to order, we could even make the Centaur a female (a Kentaurides) with jeweled glass eyes, if that is your preference! I think one reason this series of weathervanes captures our customer’s imaginations is the high level of craftsmanship that existed during the Hellenistic Greek period. The sculpture pieces in bronze and marble, as well as other artwork of this era rivals the finest artwork of any age. If you have ever traveled to Greece or Italy, visited a famous museum or picked up an art book that surveys the history of art, images of the Greek gods and their fellow mythological creatures will be among the highlights of any collection. The stories that accompany these figures are dynamic and illustrative of the human condition even two-thousand years later. For these reasons, these archetypes remain popular to this day. 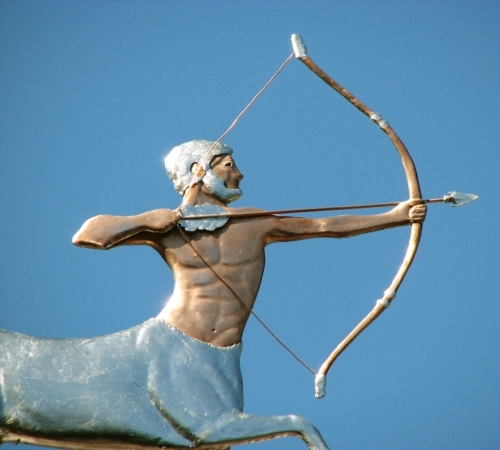 Centaurs are found in the iconic Harry Potter series, as emblems of various fraternal orders, and of course, represent the astrological sign, Sagittarius. Hence, our growing collection of Greek Mythology inspired weather vanes. A hundred years from now, presuming the weather vane has been preserved and handed down from generation to generation, knowing who made the weather vane, when it was made and which one it is in the series, should all help make it a more valuable family heirloom.